NAMI NJ School Education Programs goals are to educate children and adults about mental health and mental illness and to provide educators with knowledge and strategies that help children and teens succeed in school and lead successful lives. Its programs have been reviewed by the NJ Council of Child and Adolescent Psychiatry and the NJ Psychiatric Association. NAMI NJ is registered with the New Jersey Department of Education as a Provider of Professional Development Credit Hours. Since its inception, NAMI NJ School Education Programs have presented workshops throughout the state of New Jersey in private, public and charter schools, Juvenile Justice Commission Schools, NJ Department of Child and Family Services Schools, Traumatic Loss Coalition, Youth Services Commission, Boys and Girls Club, and NJEA. The “Every Mind Matters” Educator Toolkit has received the Ambassador Award from the NJ Governor’s Council on Mental Health Stigma and correlates with the NJ Core Curriculum Content Standards for Health and Wellness. Approximately 13 percent of youth ages 8-15 live with mental illness severe enough to cause significant impairment to their day-to-lives, but unfortunately only 1 in 5 receive treatment. Students living with mental illness have the highest dropout rate compared to students with other disabilities. NAMI NJ School Education Programs seek to eliminate stigma associated with mental illness and increase knowledge about mental health. To learn more about our programs: Educating the Educators (ETE) and Every Mind Matters (EMM), click on these headings or contact Anu Singh, Program Coordinator of School Education Programs at 732-940-0991 or email asingh@naminj.org. NAMI NJ Director of School Education Programs, Lorrie Baumann, was selected as an Outstanding Woman in Somerset County in the category of Education for 2013 by the Somerset County Commission on the Status of Women (SCCSW). Read press release. NAMI NJ School Education Programs Presents New Brunswick School Based Youth Services Program with a Mental Health Library. With the support of the Rutgers Community Health Foundation, NAMI NJ School Education Programs has presented New Brunswick School Based Youth Services Program with a Mental Health Library. The library includes 30 books, videos, and other resources to support and promote the mental health of New Brunswick students in Grades K-12. The library consists of children’s literature for all grade levels to educate young people about mental health, mental illness, stress relief, and anti-bullying. The library also includes information, resources, and strategies for educators and parents when working with young people. 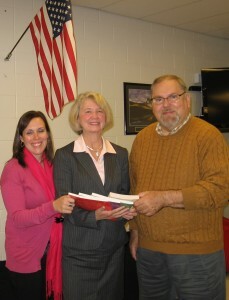 In the photo, Lorrie Baumann, Director of NAMI NJ School Education Programs presents the Mental Health Library to Meredith Masin Blount, former School Based Youth Services Program Director, and Don Stager, Clinical Supervisor. This is part of year long program supported by a grant from the Rutgers Community Health Foundation to provide professional development and support to the educators who work with students in the New Brunswick area. NAMI NJ conducted four professional development workshops for staff at New Brunswick School Based Youth Services including Educating the Educators Part I and II and Every Mind Matters Part I and II. The workshops provided staff with knowledge of mental illness, strategies for working with children who have psychiatric disorders, strategies for reducing stigma and preventing bullying, methods for improving executive functioning skills in children with psychiatric disorders and other disabilities, and mental health/mental illness education for students in all grade levels.